Bags under your eyes are a telltale sign that you’re getting older. Unfortunately, even young adults can develop under-eye bags for various reasons. While not a health concern, many people consider puffiness around the eyes to be an aesthetic issue. The following tips can help you get rid of bags under your eyes so that you can preserve a youthful appearance. If you don’t get enough sleep or are sleeping poorly, dark circles can form around your eyes. Invest in a good pillow or two and establish an effective sleep routine. Additionally, if you sleep on your stomach or side, you may be causing your own under-eye bags as well as sleep wrinkles. Consider adjusting your sleep position and learning to sleep on your back. The skin around the eyes is thin and sensitive, and it can become saggy, wrinkled, and dehydrated with excess sun exposure. Wear sunscreen, sunglasses with UV protection, and a hat when out in the sun. Stick to the shade during peak sunlight hours. Smoking is bad for more than the lungs. It also weakens and dries out the skin. Since skin quality is perhaps the first aesthetic indicator of age, weakened and sagging skin can prematurely age your appearance. Additionally, the chemicals in cigarettes can irritate the eyes, which further contributes to dark circles and bags. To prevent under-eye bags, avoid or quit smoking. Eye creams are specially formulated to moisturize the sensitive, thin skin around the eyes. Applying a light cream in the morning and/or at night can improve skin health and minimize bags and puffiness. Allergy season frequently causes puffy, watery eyes. Everything from allergy shots and antihistamine medicines to essential oils and nasal irrigation can be used to control your allergies. Take extra measures to prevent allergy flare-ups, and you will help prevent puffiness around your eyes and save yourself from the unpleasantness associated with constant sneezing, itchy eyes, runny noses, and other allergy symptoms. Your diet and drinking habits affect many things. Excess salt in your diet can cause fluid retention, which may result in puffy under-eye bags. Avoid foods that are high in salt, and choose fresh fruits and vegetables as much as possible. Alcohol also dehydrates the skin and causes bloodshot, tired eyes, so it should only be consumed in moderation. Makeup can help minimize bags under the eyes, but the processes of applying and removing makeup can also cause bags. Gently remove your eye makeup every night before bed to avoid causing eye irritation that leads to puffiness. Take care not to use too much makeup and abuse the skin by working the foundation into it, as this can irritate the tissues. Too much foundation can also have the opposite effect and make wrinkles and dark circles even more noticeable. These lifestyle steps can definitely help minimize bags under the eyes, but they are not a permanent solution. 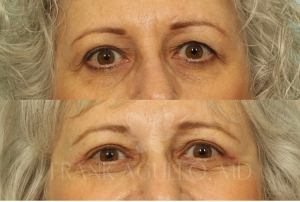 If you have perpetual under-eye bags, lower blepharoplasty can eliminate them. 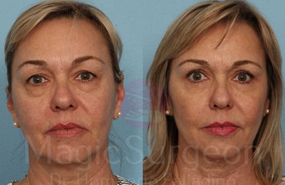 Eyelid surgery restores a youthful, natural appearance by improving tissue elasticity, removing excess fat, tightening sagging skin, and easing away bulges around the eyes. The results of eyelid surgery are permanent and restore a more youthful appearance that can last for many years. Eyelid surgery patients can maintain the best quality results by continuing to adopt the above lifestyle practices. For more information on anti-aging treatments and how to get rid of bags under your eyes, contact Southwest Plastic Surgery to schedule your personal appointment. One of our board-certified plastic surgeons would be pleased to answer your questions and help you achieve your aesthetic goals. Call (915) 590-7900 or contact us online today.